How do Collaborative Technologies Affect Innovation in SMEs? This study seeks to assess the impact of collaborative technologies on innovation at the firm level. Collaborative technologies’ influence on innovation is considered here as a multistage process that starts at adoption and extends to use. 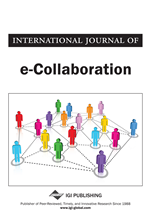 Thus, the effect of collaborative technologies on innovation is examined not only directly, the simple presence of collaborative technologies, but also based on actual collaborative technologies’ use. Given the fact that firms can use this technology for different purposes, collaborative technologies’ use is measured according to three orientations: e-information, e-communication, and e-workflow. To achieve these objectives, a research model is developed for assessing, on the one hand, the impact of the adoption and use of collaborative technologies on innovation and, on the other hand, the relationship between adoption and use of collaborative technologies. The research model is tested using a dataset of 310 Spanish SMEs.